Friday May 17th 1895 Oliver churned for me this morning. I ironed and got dinner. The boys had fixed a pen for my turkeys and as they had hatched we put the turkeys in tonight. I have 26. It rained a couple of showers this afternoon. Will come from the field and worked in the garden. I put out my tomato plants in cans. Went to bed early. Saturday May 18th 1895 I did some baking this morning and got the butter and eggs fixed to go to town. I was having Oliver do some work about the yard. After an early dinner we went to town. Will sold his hogs. gets $4.10 a hundred. I spent the afternoon over the river. I read after the sewing work was done. 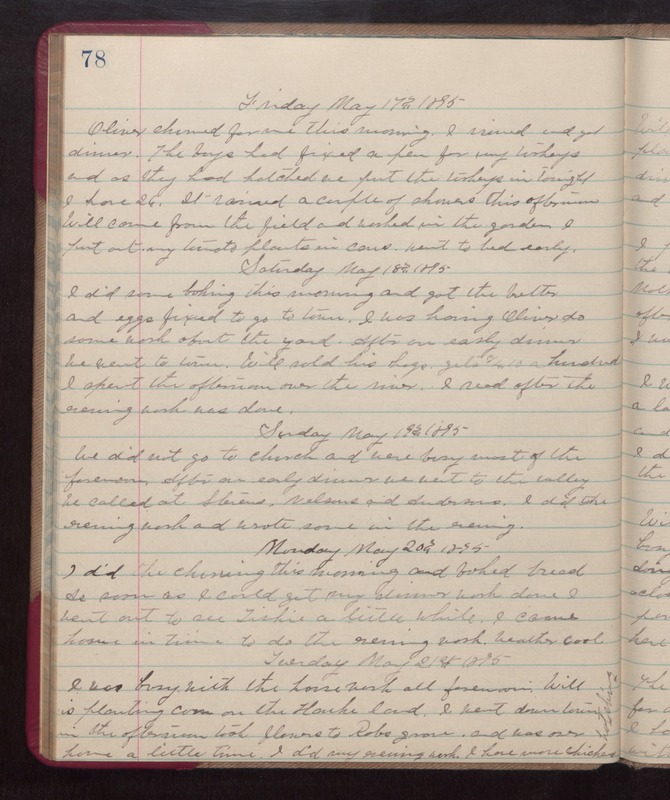 Sunday May 19th 1895 We did not go to church and were busy most of the forenoon. After an early dinner we went to the valley. We called at Stevens, Nelsons, and Andersons. I did the evening work and wrote some in the evening. Monday May 20th 1895 I did the churning this morning and baked bread. As soon as I could get my dinner work done I went out to see Tishie a little while. I came home in time to do the evening work. weather cool. Tuesday May 21st 1895 I was busy with the housework all forenoon. Will is planting corn on the Hanks land. I went down town in the afternoon took flowers to Robs grave, and was over home a little time. I did my evening work. I have more chickens hatching.